Nov. 8, 2017 | 5:10 p.m.
One of the specimens in the Wisconsin State Herbarium's collection is a plant gathered by a colonel in the 1st Wisconsin Regiment during a Civil War battle near Atlanta on Aug. 14, 1864. The plant life of Wisconsin does not lend itself to tidy categorization. The state is a place where multiple regions of North American flora converge, and where climate and human activity continue to reshape the landscape. Nonetheless, the Wisconsin State Herbarium has worked since 1849 to impose a semblance of order on it all, gathering and cataloging plants, fungi and other organisms in a vast collection of samples pressed onto card stock. Based in Birge Hall on the University of Wisconsin-Madison campus, the herbarium has built up one of the largest botanical collections of its kind in the world. Previously called the UW-Madison Herbarium, it became the Wisconsin State Herbarium following the enactment of 1995 Act 101. For more than a century-and-a-half, generations of botanists have helped to build up the herbarium, and it has survived fire and the beginning of the digital age. Herbarium director and UW-Madison botany professor Kenneth Cameron detailed the institution's history and discussed why Wisconsin benefits from such a large collection of pressed plant specimens in a September 20, 2016 talk at the Wisconsin Historical Museum in Madison, recorded for Wisconsin Public Television's University Place. He delved into how the herbarium's collection can provide insight into the state's natural history and the present-day reality of climate change, and discussed how the institution is embracing technology and trying to make itself more accessible to the public through initiatives like the searchable WiscFlora database and other online databases. Cameron also delved into the research uses of maintaining a massive number of plant specimens. Gathering not just thousands of kinds of plants, but also many specimens of a given species over decades can prove revealing. For instance, the herbarium has acquired specimens of wild columbine (Aquilegia candensis) from Sauk County since the 1940s. 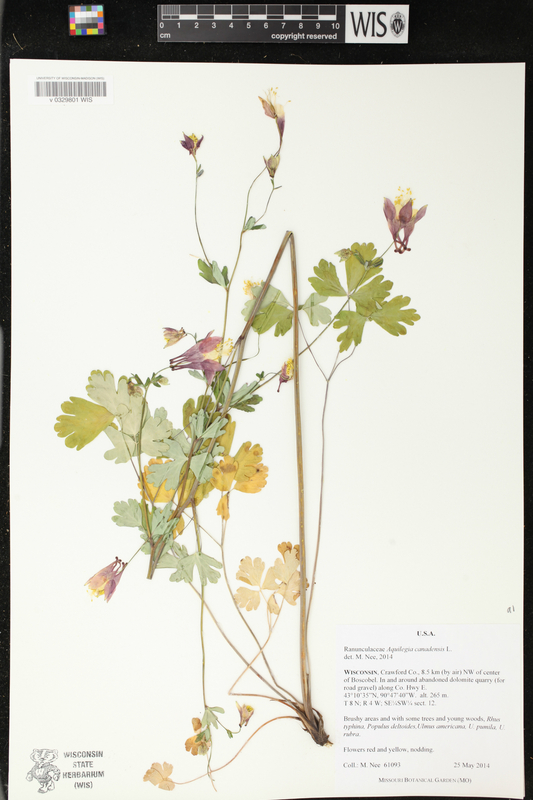 The Wisconsin State Herbarium has been cataloguing wild columbine specimens for decades, including this plant collected in 2014 near Bascobel in Crawford County. Based on the dates each of those specimens was gathered, botanists have deduced that the plants have been flowering earlier and earlier over time — nearly a month earlier in 2016 than in the 1940s, in May instead of June. This difference helps to illustrate how climate change impacts the phenology of plants and animals. It takes a lot of time and work to develop a collection like the one the herbarium keeps, but Cameron sees it as essential to understanding Wisconsin. "To really know this state, not only do you need to know its history and its people, but you need to know its plants," Cameron said. The Wisconsin State Herbarium boasts more than 1.3 million specimens of plants, lichens, fungi and algae, making it one of the largest collections of its kind in the world and the third largest public-university herbarium in the country. Among these specimens, 260,000 of the plants in the herbarium are native to Wisconsin. The herbarium's specimens are pressed onto card stock or folded into small packets. One reason that Wisconsin attracts attention from botanists is that it is a convergence point for six different regional floras found across North America. The state is home to elements in common with the biomes of Appalachian deciduous forests, Midwestern Ozarks forests, Great Plains flora, boreal forests, western United States flora and southeastern U.S. coastal plain disjunct plants. The flora of Wisconsin have changed dramatically since the first European settlers arrived in the region. Since the state's founding, its residents have cleared broad swaths of land for agriculture, felled most of the original forests of the North Woods for timber, and built cities and sprawling suburbs. Global climate change has also contributed to changes in Wisconsin's flora. Wisconsin and Delaware are tied as the states that have experienced the most dramatic change in temperature since Earth Day was first celebrated in 1970. Increase A. Lapham, an early Wisconsin naturalist, inaugurated the herbarium's collection in 1849 by donating his own personal assemblage of between 1,000 and 1,500 specimens, some of which are still archived. However, many of the herbarium's founding specimens were destroyed in 1884, when its then home of (Old) Science Hall burned to the ground. But about 1,300 specimens somehow survived that fire. Increase Lapham often sold his mounted plant specimens to fund research, so his collection is scattered about in other herbariums around the nation. The Wisconsin State Herbarium's collection grew significantly in the early 20th century, thanks in part to moss expert Leyland Cheney, fungi collector John Davis, and plant taxonomist Norman Fassett. In the 21st century, the herbarium continues to grow with specimens donated or purchased from private individuals and other universities. UW researchers also still gather specimens in the field across the state. The late botany professor Hugh Iltis helped the herbarium grow its collection of vascular plants, building it up to about 670,000 specimens. Since 1999, the herbarium has stepped up its efforts to help people access information digitally through the WiscFlora database. The herbarium has also helped create DNA sequences of Wisconsin flora. On how the herbarium's samples are gathered: "Basically, we go out into the field, we collect the plant specimens that we're interested in, we press them between newspapers, dry them and ultimately mount them. On the complexity of plant life in Wisconsin: "There's almost nowhere else in all of North America where you have an overlapping distribution of all of these different floristic elements, these botanical communities, all converging and overlapping in one place. … Five of 17 world biomes can be found in Wisconsin. There is really nowhere else in the continental United States where you can capture this much interesting diversity." On how southern Wisconsin's plant life has changed over time: "In the south, in southern Wisconsin for example, prior to the 1800s, we would have seen a mosaic of grassland prairies, savannas mixed in, oak trees for example, in these forests. And the maintenance of that biome or that forest and grassland community would have been primarily by fire. There was grazing as well by bison and elk and other animals, but fire was very important. Today, fire has mostly been suppressed. The southern part of our state is dominated, of course, by agriculture. There's a few small woodlots which allow for selective logging, hunting and recreation, but there's not much left of the original vegetation of course." On changes in northern Wisconsin: "Prior to European settlement, it would have mostly been old growth, sugar maples, the large white pine forests, hemlocks, yellow birch. Not much fire in the north because it's cold and wet, but we would have seen blow down from storms, occasional fires. Today, of course, logging is important. Not much agriculture except in the form of cranberry farms which have cleared vast areas of northern bogs and boreal forests. And the plants have been replaced by fast growing species such as aspen and paper birch." On why the herbarium has more than one specimen of many of its species: "Part of the reason is that plants and animals are diverse in their morphology, right? If we were to just choose one Homo sapien to represent our species, who would we choose? What would we choose? We're all so different. Well, the same is true in plants. This is a tiny, little one with big flowers. That's a tall, skinny one with maybe small flowers. We want to capture the range of diversity in form and distribution across the landscape."